Delivering the ultimate sound package in a small-scale, compact design, the Altec Lansing VS4121BLK Computer Speaker System is an audio experience that simply must be heard to be believed. Offering insane acoustics for such a small package, this Altec Lansing system boasts tweeters that deliver ultra-clear highs while a down-firing midrange driver in each satellite evenly disperses sound in it's enclosed environment. This unique design is made to deliver a warm ambiance that feels more natural to the listener. 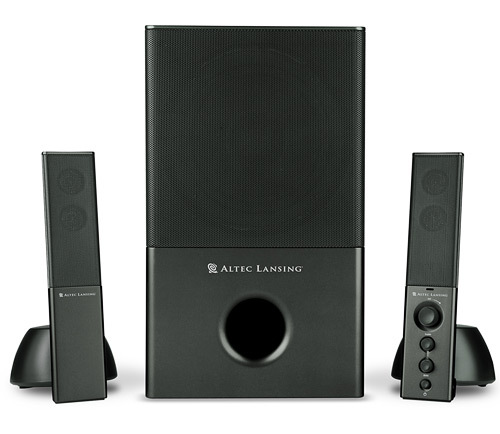 To further enhance the audio dynamics, this Altec Lansing Computer Speaker System also features a long-throw woofer which delivers all the wall-rattling bass, thumps and explosions that will up the intensity of your movies, music, and video games. Best of all, this extremely versatile speaker system is so compact, it will fit just about anywhere...meaning you'll be able to experience top-notch sound no matter where you might roam.